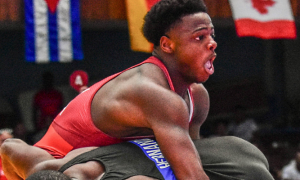 It couldn’t be a busier time for the United States Senior Greco-Roman World Team. A quick glance at the calendar shows you that this summer is crammed wall-to-wall with training camps. Such is the job description for a US World Teamer. Each year sees an emphasis put on the preparation for the World Championships, though the journey in 2018 seems to stand out even more than usual, both due to the workload and the personnel. 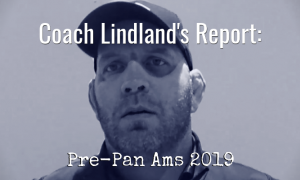 Coming out of the first World Team training camp in Oregon we followed up with a few of the athletes to see what they had to say about their time together. It’s pretty much the same formula here. 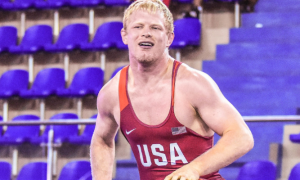 Since we’ve been chronicling the return of Sam Hazewinkel (55 kg, Sunkist) to Greco following his win at the Trials, he’s back again with some insights from the just-wrapped camp in Vegas. 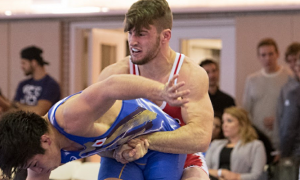 Likewise, the “Lone Wolf” Patrick Martinez (87 kg, NYAC) offers his take on the happenings from a week ago and what he gleaned from the expansive training excursion in the desert. 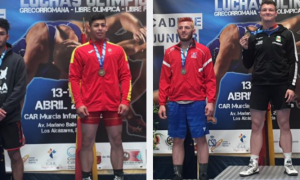 Both athletes also discuss their general training plans and what they hope to get out of the Seniors’ impending trip overseas for the 2018 German Grand Prix and its attached international training camp. 5PM: We talked after Oregon camp, which didn’t include actual wrestling as part of the agenda. Now you’re coming off of the Vegas camp, and that was all about wrestling, your match plan, and offensive attacks. How did you like the switch back over to a wrestling-infused curriculum? Hazewinkel: It was good, I liked it a lot. I was a little concerned about what kind of shape I’d be in, but I didn’t expect my body to be at 100% anyway. It wasn’t, but I started to get going eventually. I wrestled a good bit with Dalton (Roberts), and let me tell you, that dude is strong. He really impressed me. I know it might be deceiving because he looks young, but he really brought it. I didn’t get a chance to put my hands on him in Oregon. But yeah, we had a lot of fun. 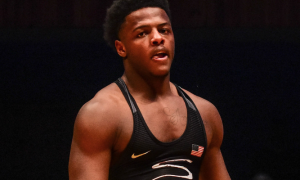 Not that anyone would say otherwise, but rest assured, he is absolutely deserving of being on the World Team. Keep an eye out for this guy. 5PM: What did you think about the general environment? The Vegas camp was not held at a traditional training center, you were practicing in a hotel ballroom with other US Teams present. Hazewinkel: It was different. I didn’t know what to think at first, but I liked it. It wasn’t on the Strip, and that’s what I was worried about. You get a bunch of young guys in Vegas, I didn’t know how that would work out. But we were down there at South Point (Hotel), which is a little ways off. The guys seemed focus and that was good. What surprised me is that I really liked having the Junior and U23 Teams there. I thought that went really well. It kind of put a little pressure on the older guys not to complain so much and to set a good example. You look over, and all the time you’d see an older guy helping out the younger guys. I thought that was really good, but it just might be the coach in me. I thought that was excellent for the young guys and the World Team guys, just to have to give back a little bit. It’s hard to coach up kids on how to do it right and then go out there lazy, do it wrong, or complain about stuff. I thought it went real well. It was smart. I wish they did it a long time ago and I hope they do it moving forward. I thought it was a great idea. 5PM: You are technically about 40% through the training phase for the Worlds. You talk a lot about how you feel physically, so how do you feel at this stage in the game? Do you feel better than you thought you would, worse, or right about how you expected? Hazewinkel: I do a lot to keep convincing myself and I find that saying it out loud helps. If I get in my own head I’ll push it. I’m not where I want to be in my mind, like how I’ve trained for the last 30 years. I know I used to stay right up there near peak all the time and I am nowhere near that, so I say that out loud to keep myself even-keeled about it. I’m not where I want to be for Worlds, for sure. For the Germany tournament, I’d like to be in a little better shape. My technique, I’m happy with that. I’m still strong on my feet. I feel like this last week really helped my defense. I needed to get some par terre defense with better guys. That is the part I probably got the most help out of at camp, so I was fine-tuning that. My shape? It’s so hard to say. I know I can be in better shape. That part of me wants to get better. I know I’m not quite there. But — it’s part of a plan. The plan was not to be peaking early. So, I’m happy with where I’m at. I’d be lying if I said I wasn’t a little anxious about wrestling in under 100% shape, but that’s part of sticking to the plan. On that part of it, I’m glad there aren’t a whole lot of guys there (in Germany), but I’d rather see a bunch. Part of the whole idea behind me going to Germany was to catch up on how they are doing the calls, how the guys wrestle now. But I wanted some matches, and for me, that was the whole idea. I really wanted to get a feel for how they’re doing things. I don’t know if I need the matches in the sense of experience. I’ve had enough matches in my life, I know how to show up for a tournament, and I know how to get in the zone as much as you can. If I figured out how to really get in the zone I’d be a millionaire. I’d write a book and make a bunch of money. I know how to get game-ready. It’s definitely more to just get caught up on everything. It’s different than watching it on film. You get the mannerisms, you can see if the refs are helping a guy or not. You catch all of the little things that help you understand it better. 5PM: Like you said, you’ve had a ton of matches throughout your career. 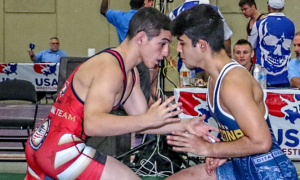 However, it has been awhile since you’ve competed against an international Greco opponent. The concept of the “foreign feel” sometimes alludes US athletes, so would that be another primary focus of yours heading into the 2018 German Grand Prix? Hazewinkel: Yeah, the two are basically equal. Knowing how they ref, which we talked about, how that changed from the US Open to the Trials. The hand-grabbing threw me off, how fast they were calling it and how strict they were being about it. I want to know anything like that with the refs. If they are being picky on bottom grabbing hands, fighting hands, or if they’re letting it go. Those little things make a big difference. Or stopping a lift and giving up a stupid two points when I didn’t need to. There is a time to fight hands and not give him the lock, and there is a time to fight hands if you’re in big trouble. If anything goes, it’s worth doing both of them. If they are calling quick cautions, it’s only worth it if the guy is about to launch me. So, I want to learn that side of the refs and the feel is definitely the other part of it. As the rules change the sport evolves. More and more, that’s why I think they change the rules so much, just to kind of keep the sport evolving. Which I don’t know if I’m behind that, I think the sport would evolve on its own if you left the rules alone so people would know what’s what. It’s funny when my dad watches. He’s like, Why are they scoring points? He’s a two-time Olympian and he has no clue. It bugs me when they change the rules, but I think that’s why. It keeps things moving, it gets different people winning, and it forces the sport to evolve. I need to get a good feel for that. You mentioned how Americans are missing the feel and I think I was lucky because my dad would do that with me all the time. He’d say, Oh, you’ve got to wrestle the Russian today. Then he would wrestle like a Russian, which, Russians back then were way different than they are now. When I grew up, Russians were like the guy Rocky fought; just straight at you, really strong, and blocky. Now, they are lot looser and more explosive. You can see it on film how they wrestle. Japanese athletes wrestle a lot like how my dad did with me. They are ninja-esque, very sneaky, but when they do go, it’s explosive, it’s fast, it’s sharp, it’s crisp. That helped me a lot. It didn’t surprise me when I began competing internationally and the styles were different. The idea that it would be different wasn’t a big deal to me. The styles, they are what they are. You have to learn them. It’s kind of funny because as you get older you learn each country’s folkstyle, and their folk style gives you what kind of wrestlers they are. I think it’s Kazakhstan, you can watch it on YouTube. They’ll put 100 guys in a football stadium and if you touch a knee, you’re out. So they do a lot of footsweeps and a lot of upper-body attacks. It’s fun, they wear uniforms. By the end, it’s a big mud pit. There’s no grass left. It is fun to watch, but when you wrestle those guys it makes a lot more sense why they’re good at hip throws, footsweeps, and they don’t shoot a whole lot. You can learn a lot by watching each country’s folkstyle and I find that interesting. 5PM: The Vegas camp was completely wrestling-based. Did that provide any kind of a boost or a different feeling compared to Oregon, which did not include on-the-mat work? 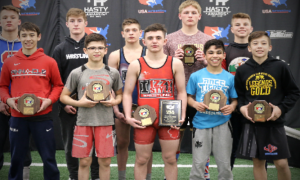 Martinez: In Oregon, we had a good energy and a good vibe, but being on the mat together (in Las Vegas) further boosted that energy, that drive, and the will to become World Champions. Everybody had a great attitude, even more so because we were on the mat wrestling, which is what we love to do. In that way, it definitely provided a morale boost compared to Oregon. 5PM: The setting was also different. In Vegas, it was not a gym or training center, it was the South Point Hotel. What did you like about the atmosphere, and what did you not like? Martinez: There were some pros and cons to the situation. The pros were we got to train with the Juniors and the U23 Teams. I think it was amazing to have them around and be able to feed off of their energy since they were in the same room as us. But for me personally, I didn’t like the location. I didn’t like being in Las Vegas. The dining wasn’t ideal for me. I usually have four meals a day, in Vegas we only had two. It was a good camp, I don’t want to take anything away from it. But as far as the location — and I recognize that the coaches put a lot of time and effort into this camp — Vegas wouldn’t be my first pick to go back and do this same type of camp again. I do understand and appreciate the logistics and how difficult it is to organize a camp like this on the road. It’s a lot more difficult than doing it in the Springs. It was an amazing feat by the coaches to put this together. And I also understand that it brings the state coaches together with the National coaches to further grow Greco-Roman wrestling. But for me — if you’re going to ask what is comfortable for me and my training — Las Vegas wasn’t ideal. 5PM: The training was centered around creating match plans, fine-tuning offensive attacks, and so forth. Did this style of a training camp mesh well with what you’re looking for as you train for the Worlds? Martinez: We have this plan, we fill them out, and then we go to practice to do them. For me, I felt like it was a little too micromanaged because we have our plan and then once we get to practice we’re on the whistle constantly for two minutes, three minutes, back-and-forth, etc. I wish we had just a little more time, say a 30-minute block on our own, Okay, ready…set…go type of thing. It was a little too micromanaged, I thought, and a little too uncomfortable to get my plan done how I would have wanted to do it. But to be fair, maybe I went into the workouts with a different idea of what they would entail. I thought going in that we would write up this plan and that it was going to be a lot more individual. Like say, Write out your plan and then take 20 minutes to work out what you want to do. Just a little bit more freedom. But I guess I interpreted it differently. Instead, we were on the whistle and doing drills — which is good — it’s just not what I expected from the beginning. 5PM: You’re two camps down, now you’re going into Germany for the 2018 German Grand Prix and then an international training camp. Do you have specific goals in mind either competitively or otherwise you’re trying to accomplish in Germany? Martinez: I have a couple of things on my feet that I’ve been working technique-wise, just a couple of adjustments. I want to work on those in competition and see how I can implement those new strategies and techniques. Same thing with par terre, I’ve been focusing a lot on par terre defense and offense. The best way to practice those areas is competition. Obviously, I want to go into this tournament with the mindset of winning it, that’s the goal. But the other goal from this tournament is to learn from it. To try out things a little bit more and to get really fine-tuned for the World Championships. I want to win the German Grand Prix, obviously, but I also want to work on things and fine-tune myself. That’s the mindset I’m going into this tournament with.